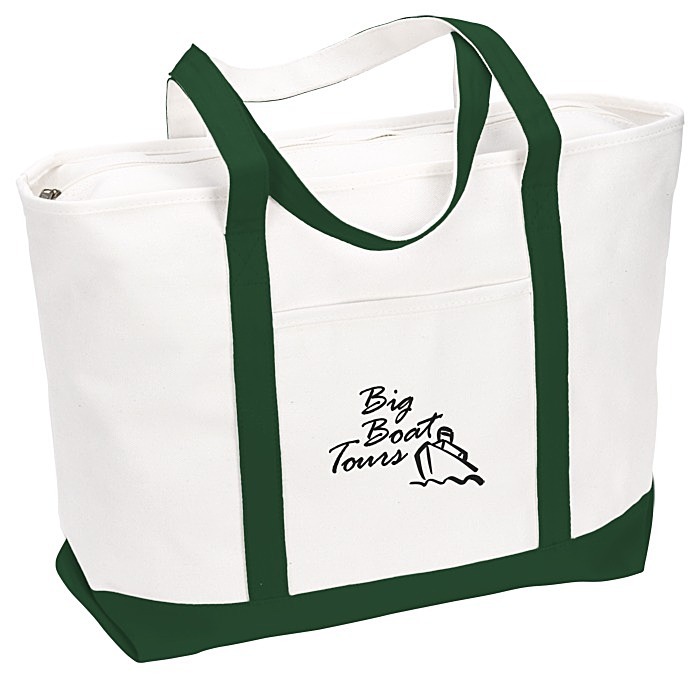 Your logo rides the calm, steady current of this canvas tote bag! The zippered top secures this boat-style 24-oz canvas tote for on-the-move customers. Dual 30" handles also cater to mobile lifestyles. You’ll find an easy-reach slip pocket between the front handles. The thick natural-colored canvas is highlighted by bold-colored, outlining trim. If you would prefer an embroidered imprint on this tote, see item #114308-ELarge Heavyweight Cotton Canvas Boat Tote - Embroidered. Size: 14" x 24" x 7" bottom gusset.